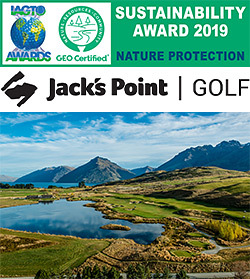 Jack's Point Golf Course near Queenstown, New Zealand has received the prestigious IAGTO Sustainability Award for Nature Protection presented at an international ceremony last night in Slovenia. Jack’s Point was selected by the International Association of Golf Tour Operators’ sustainability partner, the Golf Environment Organization (GEO) to receive the 2019 Nature Award. Jack’s Point Golf General Manager, John Griffin says the team are thrilled to have been recognised for their long-term commitment to sustainability and nature protection. “We are delighted to have achieved this international recognition for our ongoing work to preserve our unique natural environment at Jack’s Point,” he says. Jonathan Smith, GEO Foundation Executive Director says Jack’s Point Golf Course won the 2019 Nature category due to its extraordinary preservation of the breath-taking natural landscape. The winners this year highlight the fact that golf has the potential to improve the land and the lives of people who come into contact with it. “Completed in 2008, the course construction was so sensitive that only five per cent of the entire 3000-acre site will ever be touched. A range of natural materials was utilised, with recycled on-site materials incorporated as much as possible, including local wood and stone. Man-made structures were sited appropriately below sight lines and away from natural bluffs and elevated areas. Legislation was in place to ensure the open grassland habitat and rocky terrain (appropriately named ‘The Remarkables’ mountain range) will always be protected and the course is absolutely committed to the preservation of the environment. Wetland habitats were created and existing ones regenerated with improved water quality, previously degraded by pollution from livestock farming. The course has its own irrigation supply and waste water treatment system,” he says. Golf course designer John Darby says the focus has always been on protecting the natural environment at Jack's Point, with the surrounding 35 kilometres of hiking trails and extensive wildlife habitat driving their design ethos. “We made some ground rules for ourselves very early on - one was to make sure 95 per cent of that area was kept as open space for everyone to enjoy,” he says. “We devoted the very best of the land to the golf course. And that land also contains the trail network, which is quite unlike most developments where the very best waterfront land is given over to development. In this case we decided it should be given over to a wider use that could be shared and used by everyone at Jack’s Point, not just the lucky few on the lake. “We wanted to retain the natural character around the course, so we threaded the holes in between the scrubland and native pastureland, we even kept the sheep grazing in and around the course. This way we created a course that related to the past history of the land and introduced a new use, but one that was sympathetic to the natural environment, but also to the individual as well,” Mr Darby says. This year Jack’s Point also became GEO Environment Certified, endorsed by GEO Foundation and the R & A and European Tour, for championing sustainability in golf and through golf. Jack's Point Golf Course is an unforgettable experience. The 18-hole par 72 championship course offers golfers an exciting challenge with five tee positions. The course follows natural contours of tussock grassland, dramatic rocky outcrops and steep bluffs overlooking Lake Wakatipu.The Clubhouse’s architectural design blends seamlessly into the landscape, and it features an award-winning restaurant reflecting seasonal local produce. Jack's Point is a 1200 hectare (3000 acre) settlement in one of the most spectacular landscapes in the world - on the shores of Lake Wakatipu, 20 minutes’ drive from Queenstown and 10 minutes from the airport. It is home to a pioneering spirit, a championship golf course and over 35 kms (22 miles) of hiking and mountain biking trails. The IAGTO Awards, held annually by the International Association of Golf Tour Operators since 2000, showcase the best golf destinations and resorts as voted for by the world’s golf tour operators and golf travel writers. The award was announced at IAGTO Awards Gala Dinner IGTM in Ljubljana, Slovenia in front of an audience of 1200 international golf tourism delegates. IAGTO is the global trade organisation for the golf tourism industry, comprising over 2220 accredited golf tour operators, golf resorts, hotels, golf courses, receptive operators, airlines, tourist boards, approved media and business partners in 98 countries. IAGTO operators control over 87% of golf holiday packages sold worldwide and their combined annual turnover exceeded €2.1 billion last year.